Sarens was contracted to transport and install a 1700t A-frame pylon for the New Wear Crossing Bridge project. The New Wear Crossing bridge, a project of the city of Sunderland in the UK, is currently under construction and is scheduled to open in 2018. The bridge will span the River Wear from Castletown to Pallion, and its centerpiece will be a soaring 105m-high pylon. Sarens had to transport the pylon from the Victor Buyck Steel Construction yard in Ghent, Belgium to Sunderland. Carl Sarens, director of global operations and technical solutions, projects and engineering, said the first challenge was to slowly manoeuver the pylon out of the fabrication yard and onto the two canal bridges. The pylon had to be jacked down onto Sarens' twin barges, Jozef-Rosa and Karel-Victor, using a combination of Sarens' PJ250 jacking system, and jack and pack with 52 axle SPMT lines. During the two-day loading process, the barges were moored with a variety of hydraulic winches. “This was a slow process because the ballast of the barges had to be carefully adjusted throughout the operation,” Carl Sarens explained. Once the pylon was secured, the team had to manoeuvre it along tight canals, under a series of low bridges, and into the Port of Ghent. During the journey, Sarens operators had only about 30cm of margin on all sides of the pylon to clear the bridges. At the Port of Ghent, the pylon was then transferred to Sarens' larger sea-faring barge Louis. For this, the twin barges were first driven apart with SPMTs and once they were adequately separated, the barge Louis was inserted between them. The pylon was transferred using SPMTs and ballasting of the barges. Once onboard the Louis, the pylon was rotated 90° and set down on its sea-fastening supports. 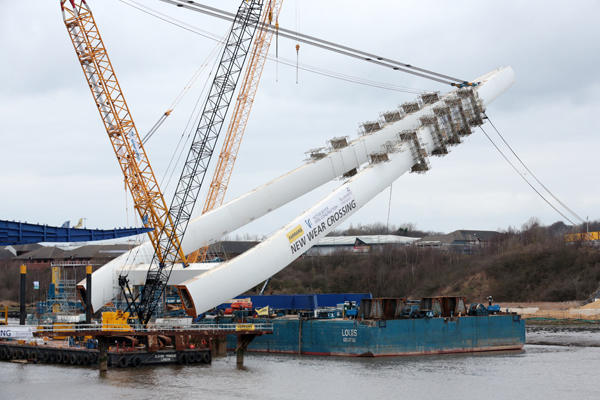 Two weeks of preparation followed before the barge was ready for its two-day sea journey to Sunderland. The pylon's long journey came to a close when the Sarens team carefully lifted and positioned it at its full height. Sarens has released a video of the transportation and lifting process.